This is an old fashioned recipe that needs to be made more often! In a large pot boil water and put the whole head of cabbage in the water and cover. Simmer for about 5 minutes until the leaves become tender. Remove the cabbage from the water and let the cabbage cool. In a large frying pan place the ground and cook the chop meat separating it. When the meat is cooked remove the meat from the pan and place in a large bowl. In the same pan, drizzle a little olive oil and place the parsley, garlic, onions, carrots and mushrooms and sautÃ© until the onions become slightly golden. Place these veggies in the bowl with the ground beef and toss. Add the tomatoes that were chopped in the food processor and the bread crumbs and toss. Wait a few minutes to let everything cool down and then add the beaten eggs and toss. In the same frying pan drizzle a little olive oil and add all of the ingredients for the bell pepper topping EXCEPT the cheeses. 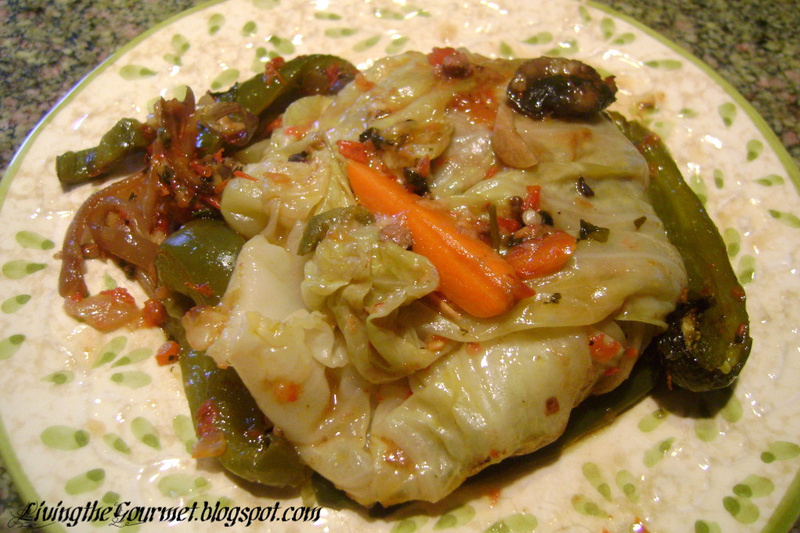 Let this sautÃ© while you begin stuffing the cabbage. To stuff the cabbage gently peel back the leaves one at a time. Peel as many leaves as you want to stuff. Place the leaf on a flat surface and using a large spoon place the stuffing in the middle of the leaf. Close with a tooth pick. 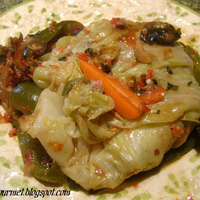 Drizzle a little olive oil in a backing dish and place the cabbage in the pan. Top with the peppers and top the peppers the mozzarella and grating cheese and a drizzle of olive oil. Can't wait to try this out on the eaters!